11824Bathroom Illuminated Mirror - Chrome Extenda..
6560Bathroom Light - Illuminated Mirror Glass Cabi..
1456CCBathroom Shaving Mirror, 3 X Magnification,..
7450Bathroom Ip44 - 2 Light Touch Bathroom Mirror ..
8510Bathroom Light Ip44 Illuminated Mirror Rectang..
9305Bathroom Light Led Mirror, Battery OperatedThi..
71720The Spectrum LED bathroom mirror features a l..
Fuji 950 0662Mirror finish, sandblasted detail.Use..
Fuji Shaver 0548Fuji Shaver illuminated mirror.Mir..
Fuji Wide 1250 0536Mirror finish, sandblasted deta.. 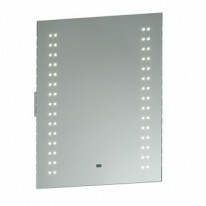 Glimpse 13885Glimpse IP44A truly contemporary mirr..
39237Omega IP44The Omega LED bathroom mirror combi..
13760Perle IP44The Perle LED mirror is contemporar..
60894Revelo IP44The Revelo LED cabinet mirror incl..
447This 2 light wall and mirror lamp is designed w..
13759Spegel IP44Spegel is a stunning LED bathroom ..
51898The Toba is a beautifully simple LED bathroom..
Bathroom mirrors come in a wide range of sizes and with a whole host of feature options. First off is to get the size right either landscape or portrait and overall dimensions that your location will take. Then the options are: Fluorescent or LED lighting, With or without power point, Pull chord or sensor switch, Option of a demist pad, Some even come with an LED clock! The choice we supply is always on point and if you don't see any too your liking you are more than welcome to contact us either via phone, email or chat and let us know that you would like more choice.